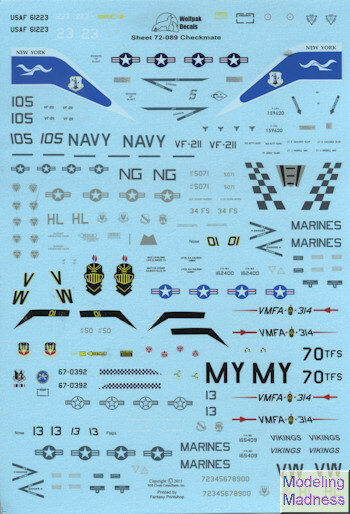 For this new Wolfpak Decals sheet we have another half dozen jets and a goodly variety as well. The initial one is from the 102 FIS, New York ANG based at Suffolk County Airport in 1974, probably the last year of the Deuce in unit service. This one is in the SEA camouflage scheme with the units fetching blue tail markings. Next, from VF-211 Checkmates aboard the USS Kitty Hawk in 1983, is this TPS F-14A. You have a variety of kits for this one and other than the Italeri kit's off shape nose, you cannot really go wrong as they all build pretty much the same. 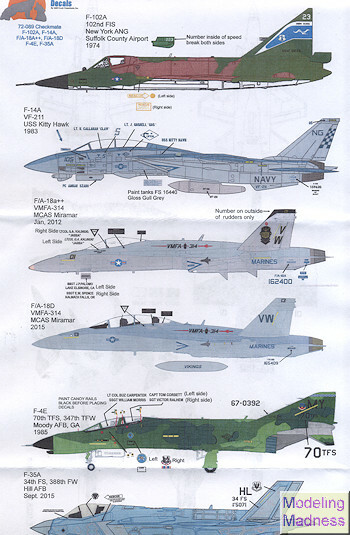 Next are a pair of F-18s from VMFA-314. The first up is an F-18A++ from the January 2012 time period with more color that none normally sees on a legacy Hornet. The other is from three years later in 2015. Apparently the unit switched over to the F-18D by this time. Pretty standard and relatively unexciting markings, but at least it is a line bird and that is what makiy of us like to build. Apparently the centerline tank was a loaner as 314 is the Knights and not the Vikings. From 1985 and Moody AFB we have a double MiG killer, F-4E 67-0392. This is the 70 TFS boss bird and is painted in the then-standard scheme of Euro 1. Finally, another new unit for the F-35A, in this case it is the 34 FS/388FW based at Hill AFB in September 2015. This one is the 34 FS boss bird. As usual for Wolfpak, the decals are superbly printed by Fantasy Printshop and the sheet comes with the best background information provided by any sheet in the business. I personally like the multiple types on one sheet format as it allows a variety of builds to be done from a single sheet.